When the third quarter of the year starts, everything seems to be faster than usual. We were in Camiguin the last week of September and I kept saying that I can't believe it's almost October. And here we are, mid-month already! I guess that's the time you realize you're having fun, because you lose track of time, no? One Went to Binondo with some friends from work for a sort of food walk. I think we've been able to eat in 5 restaurants. And I'm still thinking if I'm going to blog about it because lately, I've been too lazy. Two I think this was the first time after a long while that I took the train going home. 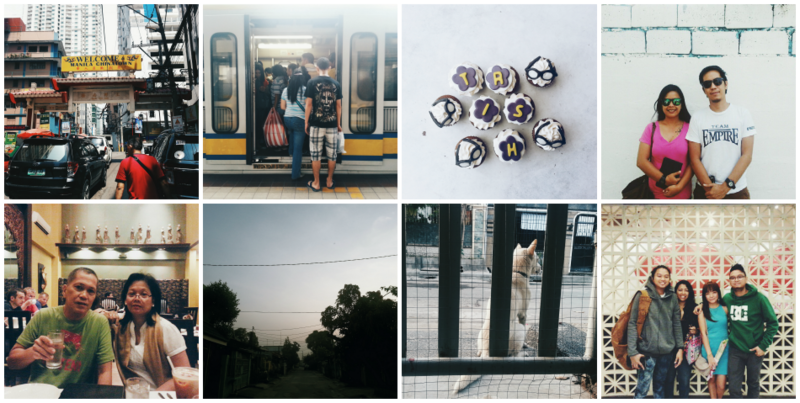 Going to Manila sure brought back a lot of memories from college. I remember those times when I rode the train most nights from Monumento back to Central before heading back home to Cavite. That's almost 10 years ago! Three My friends from work surprised me with a dozen of Mountain Dew cupcakes because it's my birthday! Hehehe. Four Finally got to spend some time with Cy and Pabs after so long. Funny thing is we live across each other but we rarely see each other! I think at some point in our lives, this tends to happen. We had lunch somewhere near and caught up with each other's lives. Five My mom asked my dad to pick her up on a Friday night. Since I was on leave, I tagged along to keep my dad company. And I was reminded of the horrible Friday night traffic in EDSA! 2 hours spent going to McKinley and another 2, I think, going home. We were so hungry so we decided to have dinner in Alabang. Six and Seven Waking up at strange times with nothing left to do but wait for the sun to come up and take photos outside your house. I swear I have the oddest sleeping patterns. ha! yes, i think breakfast (specifically coffee) is my main motivation for an early morning. but taking the time to stop and appreciate the quiet of the morning, to enjoy it slowly, and see the world in a different light (literally!) is a beautiful thing. once again, you've captured the perfect moment to convey that. 'between lenses'is a great photo challenge, isn't it? The first thing I look forward to whenever I wake up in the morning is coffee and backreading on some blogs. That doesn't make me a morning person, tho. I'm really more productive at night. Your photo is stunning! I'm glad I found your blog because your posts are very pretty! Thanks for the greeting! Gone Girl was sinister. We were the edge of our seats the entire time! Haven't seen a film that insane since Confessions. Watch it!!! Hehehe. Me too. Plus maybe also because I work night shifts, somehow my body clock is all messed up. Haha. Though the appreciation for mornings come on weekends. For some reason, I wake up really early. Thanks for the kind words, Léa! This is so beautiful... I love the idea of sunrise chats with friends, sounds quite magical. :) I am rarely up before sunrise, however, a few months ago my husband and I were in the mountains and woke up early to have coffee and with enough time to sit and enjoy the sunrise. It was magical. Thank you, Latrina! This has been my favorite blog link-up yet! happy birthday fellow libra! and mountain dew cupcakes?! what IS that? they look delicious. also, did you read gone girl? i read the book and saw the movie. if you liked the movie, you'll looove the book. so sinester and twisted, but good. Thank you, Lucinda! You're a Libra, too? When's your birthday? I found this recipe of Mountain Dew cupcakes online that I won't shut up about (I actually haven't tasted one before) and they surprised me with those. Haha! Both the cupcake and the icing had that distinct Mountain Dew soda taste, which I really love! I just don't know if other people would appreciate it as much as I did. hi, was that a DIY foodwalk? I was thinking of a walking tour in binondo also. hopefully you'll blog about it! Thanks! Binondo's got a slew of amazing restaurants, it would be a dream to visit them all! Haha! Have to agree with that. Gone Girl was so good, it hurts, but it was really disturbing. Hahaha. Nevertheless, it was a great movie! You may also want to check out the movie Confessions. Sick and twisted! I also agree with the traffic but keep complaining anyway, haha!